Of the baitfish and sportfish farmers contacted by UAPB Extension personnel, 76 percent reported unusual fish losses during the winter of 2012-2013. Unusual fish losses are losses in excess of what would normally be expected to occur in a typical year. In many instances, farmers reported losing 50 percent of their crop. No extraordinary losses were observed on Arkansas catfish farms during the winter of 2012-2013, with the exception of some pelican problems in the southeastern part of the state. Farmers who experienced losses offered different theories as to what may have been the culprits. “These theories include increased predation by ducks, particularly lesser scaup; abnormally high temperatures in the fall of 2012, large fluctuation in water temperature observed in 2012, and insecticides and fungicides associated with increased corn and other row crop production,” Dr. Roy said. Some farmers also speculated that reduced feeding at their farm during the fall months due to increased feed prices, coupled with a colder and longer than normal spring, could have been a contributing factor, he said. 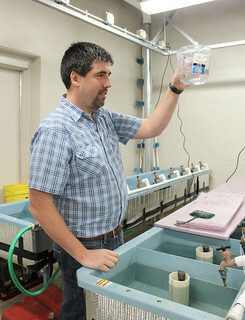 Extension personnel and researchers at UAPB, U.S. Department of Agriculture Wildlife Services and the USDA-Agriculture Research Service Harry K. Dupree Stuttgart National Aquaculture Research Center are investigating the problem. Several experiments are being conducted to address different theories regarding the winter fish loss. Trials are being carried out in temperature controlled recirculating systems in the Lonoke Laboratory to address low winter temperatures and winter feeding. A field trial is also planned to examine different feed rates at several commercial farms raising fathead minnows, golden shiners and bream. In conjunction with the USDA-Wildlife Services, a study is being done to evaluate the diet of the lesser scaup (ducks) over winter months. In addition to these studies, grants are being sought by research and Extension faculty at UAPB to provide further funding for this effort. The Arkansas Department of Agriculture provided assistance in August 2013 to help address the winter fish loss issue. For more information, contact Dr. Luke Roy at lroy@uaex.edu or call 501-676-3124.